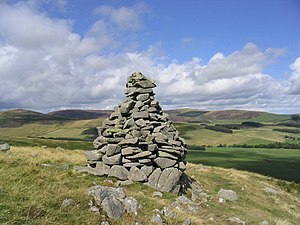 A cairn on Cauld Face. David Orr had an interesting article in the New York Times this week about the use of epigraphs in contemporary poetry. He cites a number of recent examples and offers some historical context, pinning much of the blame for the prevalence of the practice on the shoulders of T.S. Eliot. This caused me to reflect upon my own use of epigraphs in my poetry. Turns out I use them a lot. In my current manuscript iteration, perhaps a third of the poems have epigraphs. My “Dwelling” sequence, which had its origins in an essay by philosopher Martin Heidegger, even has a full page of quotations from source material for the poem. In conversation with Julie Johnstone, a librarian at the Scottish Poetry Library, via Twitter this morning, I offered that I’ve used epigraphs as a leaping off point, to set the stage or as commentary on the poem. In fact, a few recent poems, such as “Risks Are Risky,” and “Healing,” got their start from a line or quotation, the former from a tweet by Paulo Coelho; the latter a line from Gary Snyder. I like the idea of epigraphs as signposts or, to borrow from the Scots, a cairn on the trail of the poem. At the time, I worked for The Nature Conservancy and gave a presentation to a birding group. The group meeting started with typical group meeting business, then segued into a Quaker-meeting-style sharing of bird sightings and notations. It was quite poetic. Then they brought out the specimens. The meeting turned into a kind of flea market or science fair. Dead birds, bird parts, wings, feet, beaks; heads, whole birds, birds with missing wings; gashed birds, smashed birds. It was quite a spectacle. One woman removed a Ziploc bag from a portable cooler. 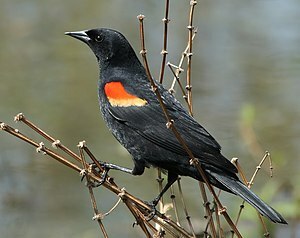 She opened the bag and unwrapped a beautiful, complete (and quite frozen) red-winged blackbird. She handed it to me. That was all I needed. and last week’s red beans. In the wake of tragedy on September 11, 2001 — in the face of it, in some ways — there were reports of poems appearing all over New York. On lampposts, bus stops, phone booths, taped over advertisements; poems to lost loved ones, the missing, the dead, to the world. Poetry seemed to be a healing force for some, a way of calling out in remembrance for others. Poems then started to appear in print, as poets from Deborah Garrison to Wisława Szymborska tried to come to grips with what had happened that day. I tried to write a poem to express what I felt about that day. I wasn’t there, I was 100 miles away in Philadelphia, but some people I love were there and their lives were forever changed by the tragedy. All of us were. I started writing the poem that November and worked on it for a while before giving up. It wasn’t easy to write about. I took it out again six years later and found it wanting. I was reminded of the poem today — nine years after the tragedy — and decided to share it here. buildings no longer there, no longer here. Their emptiness fills the space once occupied. the stranger’s glance, acknowledge or turn away. Only now, who can turn away? the father fearing policeman protecting and serving. to live with, but they make our community. The empty space left by buildings gone. Who can fill the space gone empty, gone? Over 48 hours, from noon on August 27, 2010, through noon on August 29, 2010, “hundreds of writers, editors, artists, photographers, programmers, videographers, and other creatives from all around the world came together via the Internet — and in offices in Los Angeles, Portland, and San Francisco — to make a magazine from start to finish.” It was called Longshot. He was big, really big. There ever was — the one true star. Legions of fans cheering his every move. Sold out his shows, cheered every score. That took him down the wrong path. Drugs, deviant behavior – all by himself. Further into obscurity; none missed him. Paralyzed with fear and self-loathing. Would the fame taste as sweet? Is the sandwich he ate an hour ago.